The second part of the talk on Jesus took the bread discussed about the chief tax collector who were called by the Lord and the reason why of all the loaves, Jesus took us with other four loaves. 1Jesus entered Jericho and was passing through. 2A man was there by the name of Zacchaeus; he was a chief tax collector and was wealthy. 3He wanted to see who Jesus was, but because he was short he could not see over the crowd. 4So he ran ahead and climbed a sycamore-fig tree to see him, since Jesus was coming that way. This is the Filipino version of the Gospel. Pumasok si Jesus sa Jerico at naglakad sa mga kabayanan. Doo’y may isang mayaman puno ng mga publikano na nagngangalang Zaqueo. At pinagsikapan niyang makita si Jesus upang makilala kung sino ito, Ngunit siya’y napakapandak, at dahil sa dami ng tao hindi niya makita si Jesus. Kaya’t patakbo siyang nagpauna at umakyat sa isang punong sikamoro upang makita si Jesus na magdaraan doon. Pagdating ni Jesus sa dakong iyon, siya’y tumingala at sinabi sa kanya, Zaqueo, bumaba ka agad, sapagkat kailngan kong tumuloy ngayon sa bahay mo. Nagmamadali syang bumaba at tuwang- tuwang tinaggap si Jesus. Lahat ng nakakita nito ay nagbulong-bulungan. “Nakikituloy siya sa isang makasalanan,” wika nila. Fr. Arlo asked the crowd if they noticed something weird. Imagine Zacchaeus running ahead and climbing a sycamore tree. One person from the crowd tell that the weird part is that his poise was lost when he climbed the tree because he was a rich person and the chief tax collector. Zacchaeus can do something within his powers by delegating people to work for him. Fr. Arlo called six communion ministers and Sis Zeny who acted as Zacchaeus to dramatize the scenario. Fr. Arlo asked again what can he do if he is the chief tax collector. One said he can toss some money to the crowd. Actually he can provide some body guards to assist him in dispersing the crowd and let him see Jesus immediately without climbing the tree. 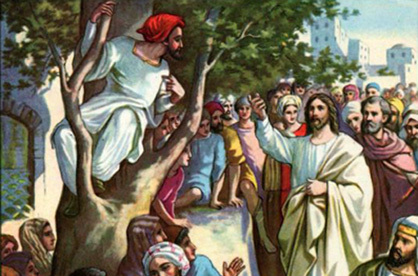 Does Jesus know Zacchaeus? Yes. Jesus knew Zacchaeus among the crowd because he is the chief tax collector and a short man. Short people can be easily noticed and stand out in the crowd. Some of prominent short people are our Ambassador to UAE, Her Excellency Grace Prinsesa, Mahal, Mura, Former President GMA and Nora Aunor. There are two reasons why Zacchaeus is considered sinful. He is corrupt because of the nature of his work collecting tax. He works with the Roman government which is pagan. This is considered treachery in the eyes of his countrymen. Like in the Philippines, the “Makapilis” who served the Japanese during the World War II are treated as traitors. Fr. Arlo asked something personal to the people. Who are the ones that just came from the office? Who prefers staying at home with his family if there is no Misyong Pilipino? Who among the crowd prefers to stay at home to cook and clean? He continued, Who are the ones that serves in the church even if it the time for the family during weekend? and Who are the ones in the crowd that stressed already in the preparation for every mass? 9Jesus said to him, “Today salvation has come to this house, because this man, too, is a son of Abraham. Why did Jesus say to him, “Today salvation has come to this house” instead of “Today, salvation has come to you?” This is because the family of Zacchaeus will also suffer from his decision of giving the half of his richness to the poor and payment of four times the amount for those people he cheated. Let say he was Php 20 million, the money that will remain with him after all the deductions will roughly be Php 2 million. Instead of buying a Toyota SiKuya / Sequia (sibling of SiAte) =), he will just buy a Kia Pride. If they plan to go to Boracay, they will just go to Batangas instead. Fr. Arlo further discussed that if anyone in the crowd and the family is affected, the blessing and safety will also be given to the family. That is also the meaning of all the things, why does God took you (Sa dinami dami, bakit ikaw ang napili ng Diyos?) . May be the Lord wants not only you to be blessed but even your family especially if your family is affected. Those who joined the communities, their family are somewhat affected by their service to the Lord. Their children will be blessed as well. Similarly with Zacchaeus because of what he did, aside from the blessing he got, his family have been also blessed. On the other hand, the only thing that the blessing is not coming towards you, may be you are carrying a heavy sin. May be your last confession was long ago that is why you are not getting the blessing. Why not schedule a confession today and receive the blessing God has prepared for you? Why does Zacchaeus ran ahead of the crowd and climbed the sycamore tree? This symbolizes humility. 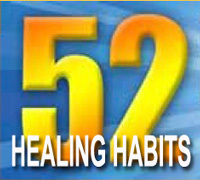 His humility including his promises to change his wrong doings brought him closer to Jesus. That is why Jesus said “Today salvation has come to this house.” May be the blessing is already prepared for you. The reason why we are called in the retreat is for us to be reminded that we also have short comings from the Lord. God is faithful to His promises but He also punishes the ones who committed sin. Fr. Arlo proved that sin is hereditary and its effect can be also inherited. Joe and Rose Kennedy have 9 children. One of them is Former President John F. Kennedy and Senator Robert F. Kennedy. There is a pattern of curses, in the case of the Kennedy’s it is the pattern of violent death. 1944: Joseph Kennedy, eldest in the family died in plane crush at age 29 during World War 2. 1948: Kathleen Kennedy died in plane crush at the age of 28. 1963: Pres. John F. Kennedy was assassinated at age 46. 1968: Sen. Robert F. Kennedy was assassinated at age 42. 1984: David Kennedy died at age 28. For those who have a history of cancer in the family, you might inherit the disease also. Kristina who took care on her sister that has breast cancer died. After 2 yrs. she was diagnosed with breast cancer and her mother was also diagnosed with the same disease. For those who have a family member that was shot dead, there will be a time in the generation of the family that a member will also be shot dead. If your father or mother is having an affair, their grand children will inherit the sin of their grand parents. Fr. Arlo has a friend in Los Banos, they are 3 female siblings. All their children are mentally retarded and special children. There are no history of mental retardation in their in-laws. But after reading the Healing of Family Tree by Fr. John Shaubs, they realized that their great grand father, their grand father and all their uncles are womanizers. According to Chinese, if the man is having an affair, it is bad for the business. There are Kabayans that are overwhelmed with debt because of womanizing. It is not only you who are affected, even your children. How can you provide your family properly? That is even if you are so alone and so lonely in UAE, do what is righteous not lefteous. May be it is exciting to explore new relationships, but think twice. Your family will be affected and the curse will go down to the family. If I am a single lady and has an affair with a married man, it is about time to end the affair. The verse is really heavy and giving us a warning. It may be unfair since the children are not aware of these. If you are not married in the church then your child will be baptized in the church, it is unfair for the child to have parents like that. On a brighter side, according to Sis Violy, someone called her informing that they decided to be married in the church because of the effect of the talk on seeking first the kingdom of heaven. If you love God just like what Zacchaeus did, he will bless your family up to the thousandths generation. For those people who have relatives who died with cancer and they want to stop it in their generation. if you want to cut the curse, serve the Lord and obey His command. There is one common denominator for cancer patients, suddenly they were declared cancer free. They went closer to God and served Him. It will not bridge the disease to your children. Those who serve the Lord has a better life than the other members of the family. Likewise on what happen to Kit (Altar Boy). The mere fact that he testified in front of us last night regarding his bible verse for the operation of his father and asking for our prayers, the Lord is already blessing all his plans in life. In Matthew 1, the genealogy of Jesus Christ was discussed. From Muhab to David it is 14 generations. From David to Babylonia Captivity it is 14 generations. From Babylonia captivity to Jesus is 14 generations. 14 is divisible by 7 and 7 is a lucky number in the Bible. On the other hand, Jesus genealogy is not perfect. He has grandmother who are sinners; Tamar, Rahab and Vachiba. They are somewhat involved in earthly things and into temptations during their times. King David’s curiosity and exploration into new relationships led to the destruction of the husband of Vachiba and creation of their child that eventually died. In the Bible the Three sevens is considered superlative, or holy, holy, holy and the most holy of the most holy. Because of this all of them still received the blessing. The calling of Zacchaeus is for the Lord to his give blessing. The Lord wants to receive his promises. May be the bad things that are happening to us; employer that is cruel or Kabayan who took advantage to us, the Lord is telling us to learn a hard lesson to make us wiser. May be we feel humiliated because He wants us to be humble. He wants us to be in our hearts so we will realize that we need to call him. The Lord wants us to serve him that is why sometimes he removes our luxuries. He wants us to have a Christian thinking. May be of all the things, we are lost and called by the Lord to give His blessing because today salvation has come to this house. As I reflect on the story of Zacchaeus, I felt that the Lord does not look on our current stature in life. It does not matter to Him if we are poor or rich, sinners or holy. If we just say Yes to His call of service even if we are unsure of what will happen next, go with it and surrender all to Him. For God is a loving God, he will not let His children down. Even if we stumble once, twice or thrice, He will accept us with open arms. What can you do to stop the curse in your generation? Share your thoughts and meet us in the comments. Thanks for the comment. Day 5 is now ready. Thanks for visiting the site. God bless. Eze , thank you for spending time to write all to this site I do really feel I completed the mission. Our family was lucky to be able to attend the fifth day and the thanks giving mass. God bless and thank you. Hi Linda, Thanks for the comment. Fr. Arlo really touched our hearts and deepen our Faith even more. Thanks for visiting. This is really wonderful article. Thank you for posting.